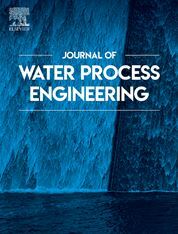 The Journal of Water Process Engineering aims to publish refereed, high-quality research papers with significant novelty and impact in all areas of the engineering of water and wastewater processing. Papers on advanced and novel treatment processes and technologies are particularly welcome. Process modelling of water treatment and novel treatment processes. Submissions on the subject of adsorbents, including standard measurements of adsorption kinetics and equilibrium will only be considered if there is a genuine case for novelty and contribution, for example highly novel, sustainable adsorbents and their use: papers on activated carbon-type materials derived from natural matter, or surfactant-modified clays and related minerals, would not fulfil this criterion. The Journal particularly welcomes contributions involving environmentally, economically and socially sustainable technology for water treatment, including those which are energy-efficient, with minimal or no chemical consumption, and capable of water recycling and reuse that minimizes the direct disposal of wastewater to the aquatic environment.